The Novotel Heathrow is situated next to the main M4 motorway spur into the airport's central area where Terminals 2 and 3 are located. 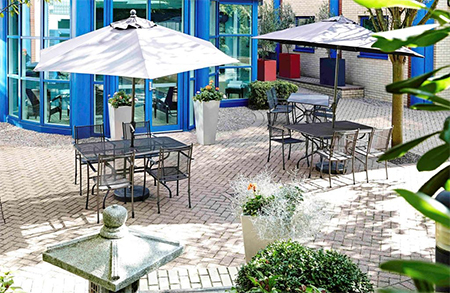 The Novotel London Heathrow Airport M4 Jct 4 is a modern hotel with many facilities including an indoor swimming pool and well equipped gym. Given its facilities room rates can be a bargain, especially at weekends when prices are normally rock bottom. With the M25 motorway also very close by this gives the Novotel Heathrow an excellent location for those looking for a long term car parking deal coupled with an overnight stay at a comfortable Heathrow hotel. The hotel and parking deals at the Novotel M4J4 is offered with parking at the hotel. As an alternative there is also a convenient option where you pick-up your car from the short term car park at the Heathrow passenger terminal you use, avoiding the bus transfers from and to the hotel. Note, if you use the parking at the hotel option there is no transfer bus to Terminal 4, only Terminals 2,3 and 5. There are two Novotel hotels at Heathrow, the other is called Novotel Terminals 2 and 3. The Novotel Terminals 2 and 3 hotel is as its name suggests is closer to the airport, one of the closest to terminals 2 and 3 for which you pay a price premium. Rooms available: Double/Twin Rooms & Executive Rooms & Suites for up to 4 people. Standard Rooms contain en-suite bath or shower, large flexible work area, TV, free WIFI, hair-dryer, iron, laptop safe, fridge, tea/coffee. Executive Rooms feature a Nespresso coffee machine, Bose iPod docking station, free Premium WiFi, free local calls, complimentary water, bathrobe and slippers. Suites are a home from home with more room including one bedroom, living room and bathroom. Sofa beds are used to extend room capacity beyond two, either 3 adults and a child or 2 adults and 2 children. Internet: Free wi-fi in rooms and public areas. The contemporary restaurant serves a varied menu for evening dining, and a breakfast buffet. Business service facilities and a 24-hour front desk..
Room Service: There is 24-hour room service. There is also an option where you avoid the bus shuttle by driving your car to the passenger terminal where a car parking representative meet and greets you and takes care of the car while you walk directly check-in. On your return the car is waiting in the short term car par. There is a price premium for this car parking option. Note terminal shuttles from the Novotel do not go to Terminal 4. You can travel to Terminal 3 and get a train free over to Terminal 4 that runs every 15 minutes.